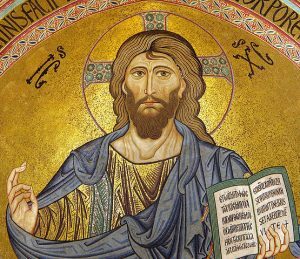 Recently, I received a question from a student about the compatibility of Nonviolent Communication (NVC) with Christianity given that the NVC worldview speaks of a world beyond right and wrong, and this person’s understanding of Christianity is rooted in those very notions. Although I have often received and addressed similar questions, this time, because the focus was so squarely on Christianity, and I am neither Christian nor a theist, I chose to engage with others: fellow NVC trainers and friends. Thirty something emails on the topic later, this quest culminated in a conversation with my friend Nichola Torbett, Founder of Seminary of the Street, with whom I often have deep discussions about theology. With all this help, I am now both ready to respond to the question I was asked, and ready to share here some specific discoveries Nichola and I made today, informed, also, by what I learned from others. The first piece that struck me in talking with Nichola was her comment that the ultimate purpose of everything in Christianity was to increase the capacity to love. According to her, Jesus was quite aware that love cannot be coerced; it needs to be allowed to rise in order to achieve the state that St Irenaeus named in the 3rd century: “The glory of God is a person fully alive.” Clearly, though, the Bible, both the original Hebrew and the additional Christian scriptures, has many instances of specific human phenomena that are said to be wrong, and by extension punishable (punishment being a clear instance of coercion). How, then, are we to reconcile them with the fundamental notion of cultivating love in a non-coercive way? Of course none of us know what Jesus exactly meant or even said. Still, a way of making sense of it emerged in our conversation. Could we look at the list of injunctions in the Bible as a draft of a blueprint for actions that, if taken consistently, would result in a growing capacity for love? It appears that Jesus may have meant at least some things this way, because he spoke of not taking what he says literally. Another Jew also addressed this kind of dilemma. I am speaking of the medieval rabbi and philosopher known to the world as Maimonides (not his actual name, though derived from it). In his book Guide for the Perplexed, he speaks of the commandments that every observant Jew follows as a path to human evolution towards the highest human potential, which, for him was embodied by Moses. I read the passage repeatedly when I first encountered it, finding it hard to believe my eyes, and there it was. Maimonides said, in no uncertain terms, that those who attain a certain level of development do not need the commandments any longer. Why then do they keep them anyway? Because of humility, and as an act of leadership and guidance to others. While Maimonides side-stepped the question of whether or not the words of the Bible are to be followed literally, Michael Lerner, in Jewish Renewal: A Path to Healing and Transformation, speaks of how, in each generation, we are asked to go back to our scriptures, whatever our religion might be, and reexamine what is, truly, the voice of God, and what are the distortions of that voice brought about by the cumulative effect of cruelty and suffering over millennia. Of course, this way of looking at things relies on the assumption that the Bible, like all other religious texts, was written by humans to capture their understanding of the voice of God. It is the humans who wrote and then interpreted the scriptures over the generations that are affected by what exists in their particular time and place. Perhaps notions of right and wrong were introduced because this is how humans at the time understood the path. Within this frame, if we see the Bible’s injunctions as a human creation, a proposal for how to walk the path of love, then they surely could serve as guidelines for self-selection, a way to attract the people for whom that particular path is a fitting way of walking towards love, while others may follow other paths. As a non-practicing Jew, for example, I often find deep affinity with Jesus the revolutionary Jew who questioned everything, a very common Jewish practice throughout the generations before and since him, aiming to restore the foundational values of Judaism, to wake up his fellow Jews to what matters most: love, care for others, creating systems based on justice, and faith in possibility. I can receive sustenance from who I imagine him to be without in any way being drawn to the specific practices and beliefs that have become part of Christianity. And what about the student? There is no question that the path of Christianity as she understands it speaks deeply to her, and I can see how much it supports her in being able to love more fully. Along with the question, she also shared with me that she sees NVC as being supportive of her being able to live the tenets of Christianity. In this, she is united with people of many religions who have expressed similar sentiments, saying that NVC gives practical form to their religious principles. The only question is whether she needs to hold her Christian principles as “right” or whether there can be a different way. Why would anyone want to leave behind notions of right and wrong when they exist in most versions of most religions as well as in other moral systems? Isn’t it a core human faculty to distinguish between right and wrong, good and evil? I come back to Maimonides one more time. In his same book, he poses this question, which I summarize and paraphrase: how is it that Adam and Eve got rewarded for the transgression of eating the forbidden fruit by being given this faculty of knowing good from evil? His answer, which I learned about first when I was fifteen, and which continues to delight me, is that it is not a reward to be preoccupied with right and wrong, good and evil. 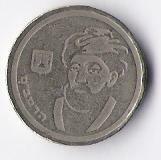 Maimonides was an Aristotelian, and was partly responsible for reintroducing Christian Europe to Aristotelian thought, which he received from the Arabs in Spain and passed on to none other than Thomas Aquinas. Within that context, his way of explaining why it wasn’t a reward is perhaps not surprising. Simply put, he argued that Adam and Eve lost a faculty rather than gained one: “he was punished by the loss of part of that intellectual faculty which he had previously possessed. He therefore transgressed a command with which he had been charged on the score of his reason [the realm of true and false]; and having obtained a knowledge of the apparent truths [the realm of good and evil], he was wholly absorbed in the study of what is proper and what improper.” This is one way of understanding what the fall from paradise means, according to Maimonides: aiming to decide what is right and what is wrong is stepping into the domain of God, not of humans, and in doing so we lost our actual paradise of being at one with the natural order of things. This difference has everything to do with NVC, because one of the core practices of NVC is the capacity to distinguish observations, which are matters of truth and falsity, from interpretations and judgments, which are matters of good and evil, right and wrong. One of my colleagues, James Prieto, is an NVC trainer who has explored this very idea about the tree of knowledge of good and evil, even without knowing about Maimonides. He concluded that “the goal is to figure out how to return to the Garden of Eden – i.e. to transcend our propensity to judge. What NVC brings to the table, indeed, is just that – through empathy and honesty we are able to get to the ‘fully alive’ state that St. Iranaeus spoke of, and Jesus was quoted as saying in John 10:10 “I have come so that they may have life to the full.” James so loved this story, that he actually wrote a book about this called The Joy of Compassionate Connecting: The Way of Christ through Nonviolent Communication. Some people end up believing that the NVC worldview says that judgments are wrong. I see it very differently. What studying NVC has gotten me clear about, and powerfully so, is that whenever I speak the language of right and wrong, I step out of what I have the authority to speak about with knowledge, and, instead, assume the position of an all-knowing entity (i.e. God!). In the most radical way, for me, I believe we simply cannot know if anything is right or wrong – we can only truly know what works and what doesn’t for us. There may be great and enormous pain and harm that is of such big proportion that we would feel pulled to call it wrong so as to invoke an authority larger than our own, to be able to rally a community, even the world at large, to stand by us. Still, from where I stand, the only position of full integrity that I can have is that the only thing we can know for sure is our own experience, perspective, needs, desires, preferences, feelings, and interpretations of reality. For as long as we stay within our sphere of authority, no one can disagree with us, although they are always free to not like what we say or do, as that is within their sphere of authority. And what happens when we step outside our authority and begin to assert what is right and what is wrong? We end up interfering with the possibility of human understanding, connection, and collaboration. Instead, we sow the seeds of war, in that others are only invited to agree or disagree. As far as I can tell, humans have been on the path of trying to convince everyone of their individual and collective version of what is right and what is wrong for about 10,000 years, and we have not gotten any closer together as a result. I simply don’t believe that it’s possible to come together on the basis of all of us agreeing to one version of what is right and what is wrong. Even the one that comes closest to universal agreement, the commandment not to kill, is not actually universal, as there are many groups, including modern “democratic” societies, that make it entirely OK to kill certain people or groups. I do believe, however, that it is possible to bring all of us together on the basis of aiming to attend to as many needs as possible, of as many entities as possible, as often as possible. Love, oneness, and caring for everyone’s needs is just as core to multiple religious traditions as are notions of right and wrong. Perhaps we might finally be able, in our explosive capacity to be connected electronically, to find a way to live out this all-encompassing love? When we got to this part of the conversation, Nichola brought up the question of whether or not there is any room for the notion of evil in the framework we were settling into. That’s when things got particularly satisfying, as I found a way to provide an NVC twist to this notion. Instead of seeing “evil” as the opposite of “good”, I saw, instead, a spectrum running from “love” to “evil”, which spans our human capacity to care about needs. On the side of “love” is the human capacity, even longing, to be in a state of love of all, a state of oneness in which everyone matters, a fully open heart. All the way on the other end of the spectrum, what we tend to call “evil” may simply be the most horrible state we can be in, when absolutely nothing matters, not us, not anyone else, not life itself. This is the state of utter disconnection, complete and total reactivity, in which harm is simply not seen as such. All is possible, in the opposite direction, as nothing unites us with anything else, and our actions themselves don’t matter. As I see it, any step we take in the direction of assigning a value of rightness or wrongness to anyone’s acts, tends to push us towards less care for this person, less concern for attending to their needs, as they are seen as less deserving. This helps explain why we are then willing to inflict punishment on people, which, to me, has always seemed fantastical, especially in contexts where love is supposed to predominate, between friends and within families, especially towards children. Before concluding I want to speak briefly of the vexing question of what we can do in relation to harm done. What is a way to respond when harm has been done that holds everyone with love, that invites responsibility, that reduces the chances of continuing harm being done, that restores the shattered trust in a community or the world, that provides opportunities for those whose actions have harmed others to be able to retain their own dignity while recognizing the effect of their actions? This is a topic I plan to revisit in the future, because the picture of the world I want to create cannot be complete without recognizing that harm does happen, no matter how well we design our structures. Perhaps some things are wrong; I just cannot know which they are. I have adopted the path of humility and not knowing. Whether or not I like what someone is doing, even when they have harmed what is dear to me, I know that I want to maintain caring for them. I want to keep my own heart open, widely open, as often as I possibly can, to move towards paradise, the Garden of Eden I see so clearly as possible in our future. The first time you comment on the site it will alert us to approve you manually. After that, your comments will be approved automatically, unless you include a link, which will require manual approval. We hope you will comment freely! This is a space for discussing tough subjects: both personal experiences and the massive challenges in the wider world. The culture of this blog is one of looking for the possibility of forward movement through loving engagement, even, and especially, in times of disagreement. Please practice nonviolence in your comments by combining truth and courage with care for me and others you’re in dialogue with. Image credits. Top: “Cefalu Christus Pantokrator cropped” Photo by Andreas Wahra, Wikimedia Commons, CC BY-SA 3.0. 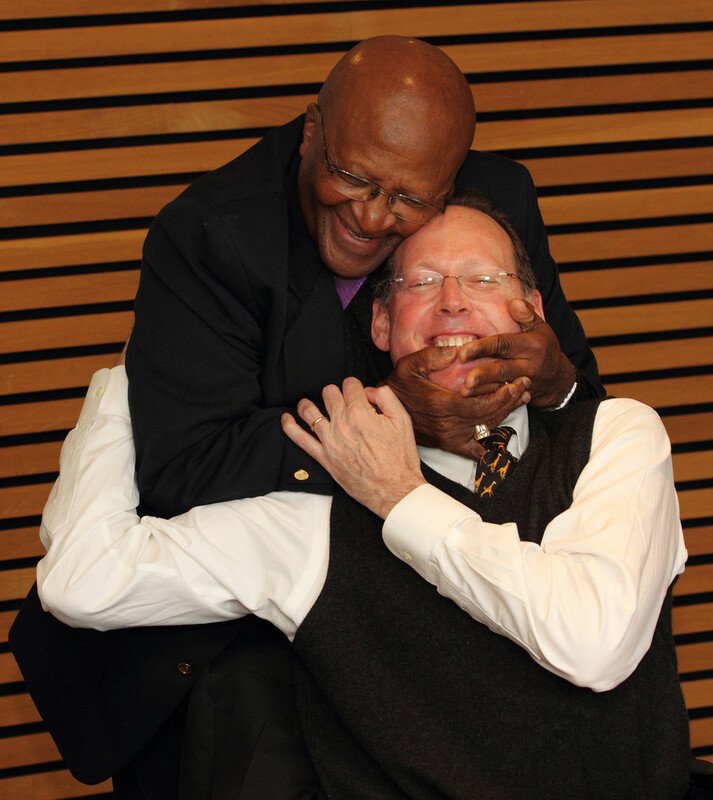 Middle: Archbishop Emeritus Desmond M. Tutu and Paul Farmer, Skoll World Forum, 2011, Flickr, CC BY 2.0. Bottom: “One NIS Rambam” by Pc84. Wikimedia Commons, public domain. This entry was posted in Uncategorized on December 5 / 2015 by Miki Kashtan. I loved this blog! I especially related to this part: “Still, from where I stand, the only position of full integrity that I can have is that the only thing we can know for sure is our own experience, perspective, needs, desires, preferences, feelings, and interpretations of reality. For as long as we stay within our sphere of authority, no one can disagree with us, although they are always free to not like what we say or do, as that is within their sphere of authority. Miki, this resonates completely with what I wrote in my dissertation on nonviolence, in my chapter 7 on “A Search for Truth,” particularly the subsection on “The Heart.” I wonder if you’ve had a chance to read this part. Though I was raised Catholic, the notion of sin, almost from the beginning, has not made much sense to me. I made my own definition of “sin,” which is almost exactly as you’ve “reframed” it. Miki, thank you for writing this blog post! I also do not identify as a theist. And on Thursday morning I went for a walk in my neighborhood and got into a conversation with a Jehovah’s Witness that was set up on a corner with a bunch of little booklets. I listened very intently to what she had to say (I was curious to get her world). Anyway, at one point in the conversation she asked me what I would have to lose from studying the Bible and I told her I would have my time, attention, and energy to lose. I didn’t get into an argument with her, but internally I did experience a reaction of feeling irritated. Her question seemed counter to NVC principles. Specifically that from NVC consciousness, we don’t “hold it over people’s heads” what we have done for them in order to try to get them to do stuff for us. And so it stimulated a question in me about reconciling NVC with religion. And then I connected with my need for reconciling these questions, and it’s to be able to connect with people who are theist. I also just identified that I have a need for being able to express myself to people (including theists) in a way that makes it easy for them to connect to me. So, your blog post was perfect timing because it also serves as an access for me to reconcile these questions that were stimulated in me. Just a quick note to say two things. One is that I am delighted that this post helped you in such a way just when you needed it. The other, and the reason I am writing, is that I want to caution you about thinking that all theists are the same. There are non-theists and theists, atheist, agnostics, Buddhists, Jews, Christians, Muslims, and all manner of people who operate in an authoritarian way. There are also all the same spread of people who are open and clear about honoring the sacredness of each other’s dignity and choice and would never impose anything on anyone. In other words: being a theist does not make someone authoritarian. People have many different relationships with what they experience as God. If you want to get inspired, for example, you can explore liberation theology. When I encountered NVC I liked the philosophy of going beyond right and wrong (which *also* implies going beyond truth and falsity – because who is to place themselves in a position to decide what is true?). I liked it because I was also attracted to relativism in its purest abstact sense. My concern is how can we know when to disagree and agree, to act, to assert ourselves, to deny others our property etc. I frequently have to mediate disputes of children over toys. Children do not understand complicated utilitarian arguments. There is an instinctive morality of property rights, even in primate groups. I therefore have to ‘come down’ from the NVC cloud out of my need for efficiency and effectiveness. If there is a way to efficiently do this to a pre-verbal toddler without being a judge, I’d like to learn about it. AN interesting story is in Kings 3:16-28 …. this is the story of the baby who had two women claiming that they were its mother. The King-Judge says in that story, “Cut the living child in two and give half to one and half to the other.” Then, as we all know in the traditional telling, there is a winner and a loser: the true mother is found out and the other woman walks away empty handed. I wonder whether with collaboration and NVC style communication the child could have ended up with two nurturing mothers and everybody’s needs taken care of. But to do this we would probably have to deny ourselves access to the ‘truth’. Because once the truth is claimed or asserted, there is a winner and a loser. I am being provocative , but I really am challenging others with more knowledge about NVC and deeper roots, to describe how we can have self esteem (“to know what we know and see what we see”) and efficiency without asserting some level of truth in our lives. Thanks for your thoughts. I believe we can go into a field of grace where compassion and acceptance dwell. But not everyone will go there with us. We still inhabit the physical realm. I do believe that we, the community, have a responsibility to one another to establish a civil order which can behave with compassion and acceptance. Yet, for those who will not go there with us we must use “protective force” to care for one another. If we all grew up in an NVC society there would be very few individuals who would need such action. Meanwhile, we need police, judges, juries, etc to maintain “law and order.” Peace keepers. Parents. Authority. You can be sure, if you do not maintain parental authority for certain children, they will eventually be controlled by police or others. Restorative justice is very powerful and very NVCish. Our current justice system could do better. As an individual I can enter that field and not set myself up as a judge or enforcer for others, or for myself. Which is not at all a denial of values, goodness, or individual responsibilities toward others. It is simply a choice to be a friend, nurturer, supporter of other as the basis of relationship. I don’t think it is the idea of right and wrong that is the problem. It is the setting myself in a place to “be judgmental,” to pressure, to force the other, or myself. Legalist relationships are an attempt to control others for the benefit of self and/or others. As a friend once told me, “You can’t solve family problem in court.” there is the realm of “power” and the realm of “human.” Some would say the realm of the spiritual. The realm of “power” is a dead-end, if one wishes for anything “human” to come out of it. So if we want transformation, connection, joy, THEN turning to judgement is a “wrong” turn. Thanks for your reply Glenn. You really got to the nub of it. I wish i had read Miki’s post more carefully too. I’ve been wanting this issue to be opened for a long time. Hope this is useful to someone. And thank you for mentioning James’ book. Jesus, Rumi, and Rosenberg all make “radical statements” which maybe were not the clearest expressions of their idea. Especially with translations and cultural differences. Yet verbal expression of an idea or concept, which the other person does not already understand leaves confusion, or misunderstanding. Especially words with high valence connotations which trigger strong feelings. The first time I heard these words, my reaction was, how can such a thing be? Where is this field where there is no natural consequences for our behavior? Have the laws of relationships and reality suddenly dissipated? How can one function or survive in such a world of fantasy? Yet, as I read more of the context and of Rumi, I began to understand that this was not at all the dropping down into meaninglessness but the rising up to a higher level of unity, where boundaries, and moral codes are no longer relevant. In the same way that fossil fuels will be no longer relevant when we have moved into clean, renewable energy systems. And that higher level is at the heart of the Christian message. Sin, forgiveness, atonement by Christ’s sacrifice, salvation and moving into the experience of GRACE. The act of faith is living in GRACE. Living in the Spirit, of unity and acceptance and connection to all of God’s children. And of course, not all those who claim to believe the Bible and Christian doctrine and theology are Walking in Grace. Missing the mark at times is where many of us spend much of our life. And there are many Christian theologians who do not consider the Bible inspired in the same way as the fundamental believers do. There is judgement and judgementalism and discernment. We need discernment to survive in this life. I prefer to use discernment although it essentially means the same as evaluating or making a judgement. All of which can be very compassionate acts. Judgementalism of course is not a compassionate experience. There is fundamental, as in foundational or basic to identity. There is also fundamentalism which is a psychological mind set which is not open to examining the foundation and generally very defensive of beliefs and identity. If your still here, thanks for reading. Thanks so much for addressing the issue of Christianity and Nonviolent Communication. I read your blog with great interest, as I am currently in the process of bringing NVC into an evangelical church with a strong fundamental foundation. Without having read either Maimonides or James Prieto, I had started to develop a realization that the “sin” of eating the fruit from the tree of the knowledge of good and evil was not so much that of disobedience, but rather, that knowing good and evil, thinking in terms of right and wrong, itself is something that keeps us separate from God (sin being understood in this context as separation from God). I would go further than Maimonides and say that it was not a punishment, but rather a natural consequence of having that knowledge. The imposed consequences came later, and even those, I do not see as “punishment,” but rather that God, in his wisdom, realized that we could no longer live in that Garden of Eden, with our thoughts now focused on good and evil, right and wrong. Thanks again for sharing, and I plan to add Maimonides and Prieto to my reading list. We want to encourage generosity in our children rather than compliance.